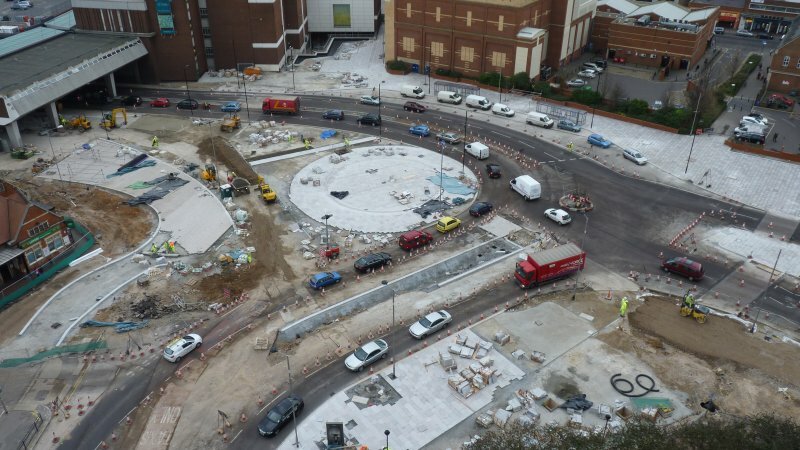 Here is the lastest bird’s eye view of the works outside Victoria Station, the new Square or circle can clearly be seen, showing the extend of the new pedestrianised area outside the Station and the improved area to the rear of the Odeon. The removal of the old roundabout will make for easier pedestrian access from Victoria Station and Avenue to the High Street and vice versa. It has allowed for the creation of a new public square, with new trees that will soon be going in, and better bus and cyclist facilities. The new junction will also see improvements to the traffic flow. At long last there will be a decent entrance to the town centre replacing the old roundabout where The Odeon and The Victorias turned their backs on the entrance to the main retail area of the town and beyond and where for years visitors have struggled to find the High Street and a way across the traffic to it! This entry was posted in general and tagged anna waite, Better Southend, boosting regeneration in Southend, Conservatives, Councillor Anna Waite, public realm improvements, The Victorias, Victoria Avenue junction improvements, Victoria Station Southend on Sea. Bookmark the permalink.